Lavender: the most magical of all herbs, has been revered, used and cultivated since the beginning of recorded time. Its virtues are limitless and its allure captivating. No other herb incites such emotion as that of lavender. Whether you love the herb for its fragrance, healthful properties or beauty, its magical qualities are ever present. The lore of lavender is deeply rooted in the early discovery of the general pleasantness of the plant and the medicinal properties of its essential oil. It was discovered early that if clothing was washed and left to dry on lavender bushes, the scent would permeate the fabric. Once the clothes were donned, the wearer would develop a sense of claim and well-being. The common name Lavender is believed to have its roots from the latin “lavare’ meaning to wash. Additionally, some theorists have suggested that it came from an early spelling of the word, “livindula,” which is latin from the word “livid” or “bluish”. Legends prescribe that when Adam and Eve were exiled they took lavender with them from the Garden of Eden, as it was thought to provide safety against evil. Legends continue to perpetuate the theory that lavender from the Garden of Eden contained no significant scent until Mary, mother of Jesus laid his clothing on the bush to dry. Lavender is referenced throughout the Bible by the name spikenard, which was the Greek name for lavender. For example, John 12 1-10: reads, “Then took Mary a pound of ointment of spikenard, very costly, and anointed the feet of Jesus, and wiped his feet with her hair; and the house was filled with the odor of the ointment.” Spikenard was used as one of the Eleven Herbs for the Incense in the Holy Temple in Jerusalem. A cross fashioned out of lavender was often hung over Christian household doors for protection in biblical times. 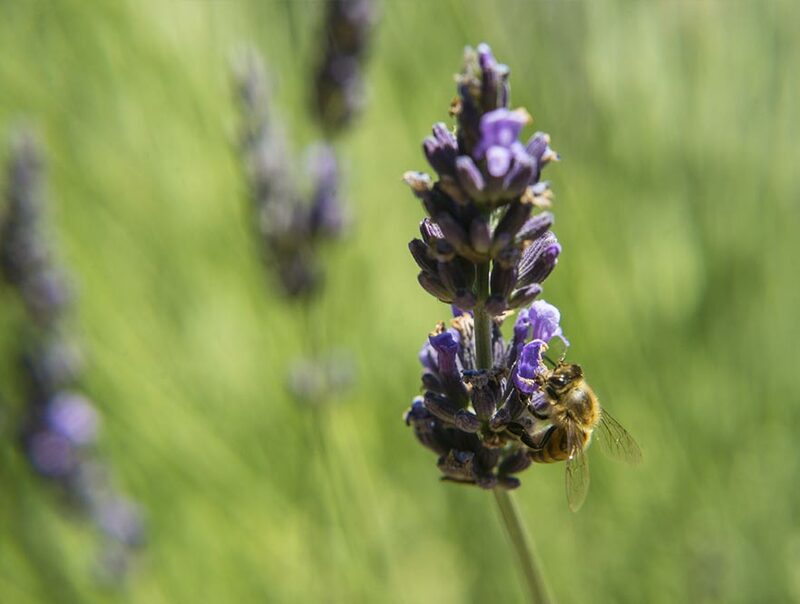 It has been well documented in ancient Egyptian Hieroglyphics that lavender was used for cosmetics, mixed with bees wax and placed under wigs to melt over the head to release the perfume, as well as in embalming and mummification ingredients. In ancient times, bundles of dried lavender were given to women in labor for squeezing during contractions as the fragrance released was known to calm the pain and facilitate an unencumbered birth. Lavender posies or sachets were given to couples as marriage gifts to bring good fortune and peace to the newly formed household. Later lavender became the main constituent in posies during the black plague to ward off the evil pestilence and mask the stench of decaying carrion. Lavender sachets continued to be prevalent in more recent times as a linen scent and a moth repellent in England and colonial America. Additionally, it was well known in colonial America that throwing wet linen and clothing over lavender bushes would absorb the scent of lavender as they dried, bringing pleasant results. More modern medicinal validation came in the early 1900’s, when French chemist Rene Maurice Gattefosse burned his hand severely while working in his lab. His initial reaction was to submerge his hand and he did so in a nearby beaker of lavender essential oil. This act relieved the pain; his hand healed quite fast and did not scar. This observation led him to continue more comprehensive research on lavender essential oil which is still going on today. We still have yet to fully understand the medicinal benefits of this magical herb. Lavender belongs in the vast mint family. There are many species and varietals with a multitide of different fragrances, uses, colors and flavors. True lavender is a native plant of the mountains of the Mediterranean region. Its cultivation and use has travelled far and wide as its popularity grew. Contrary to popular belief, English Lavenders are not native to England, but acquired the name due to its popularity in England during the Medieval and Renaissance periods. lavenders but a hybrid. Their popularity stems from their ability to produce a large amount of essential oil, have a failry fast growing cycle, and are immune to many diseases. Lavender is a timeless herb with limitless possibilities. We encourage you to experiment, taste and enjoy the presence of lavender in your life.